Florida. Meeting at Istanbul Turkish Cuisine Restaurant in Lake Mary, FL, on Sunday, October 29th at 1:00 pm for lunch. Linda Ӧzgür (T-6) lynda.ozgur@gmail.com and Paul Kirwan (T-8) are the coordinators. New York. Meeting for lunch at Uskudar Turkish Restaurant, 1405 Second Avenue, NYC between 73rd and 74th Streets on Sunday, October 29th from noon to 3:00 pm. A four-course lunch with coffee, tea, and soft drinks, tax, and tip will cost $26 per person. Hank Levy (T-8) at henryjlevy@yahoo.com is coordinating. Washington State (Seattle area). Dana Marmion (T-15) is coordinating the Bayram potluck on Saturday, October 28 from 4:00 to 7:00 pm at the home of Ruth Hultengren. RSVP to Dana at marmionducky@gmail.com. Washington, DC. Linda Scheffer (T-8) is taking RSVPs for the dinner on Sunday, October 29th from 5:30 to 8:00 pm at Kazan Restaurant, 6813 Redmond Drive, McLean, VA 22101; 703-734-1960. Cost: $55. Contact Linda (LMScheffer@aol.com) for reservations. OHIO: Saturday, October 24, 6:00 at Anatolian Café, 2270 Lee Road, Cleveland Heights, 216-321-4400. RSVP Cathy or Ron McCutcheon. KANSAS: TBA. RSVP to Susan (McHenry) Holm. WASHINGTON: Saturday, October 24, 4:00, potluck at the home of Dale & Ruth Hultengren. RSVP Dale & Ruth. OREGON/SOUTHERN WASHINGTON: Thursday, November 15, 4:00 potluck at the home of Bob & Sylva Staab. RSVP Mimi Sanders. Here are some interesting statistics on Arkadaslar attendance at the Arkadaslar Global Reunion. The three charts sorted (1) by group (2) by percentage, and (3) by attendance. Thanks, Sandy Anderson! ﻿﻿﻿RPCV Open House/Expo: In Southern Maryland on March 5 in the Prince Fredrick Library. It had 12 presenters. Librarians said 100 people stopped by:six were planning to apply to Peace Corps; two sets were parents of current volunteers, one distraught mother was afraid of her daughter's going to a country that might have some turbulence, and other people with some connection to Peace Corps or foreign dreams. 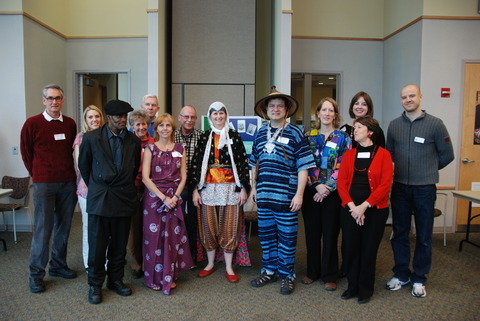 For photos go to Prince Frederick Library website. For a published article with stories of 6 of those participating: Bay Weekly. " It was a lot of fun," reported Sandy Anderson (T-13). Those of you who sponsored house parties might want to share with us if it’s convenient.